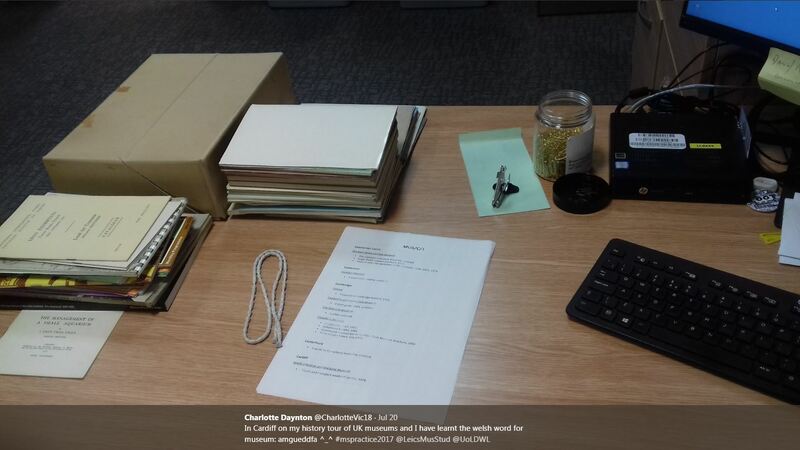 Guest post from Charlotte Dayton, MA Museum Studies student working with the Special Collections team for her work placement. Hello, I’m Charlotte and I having been doing a placement with Special Collections in the Library as part of my MA in Museum Studies. The aim of my placement has been to create a learning resource for next years’ museum studies cohort to use for their studies and assignments. I have been sifting through a, what seems to be long lost, museum’s collection that have been sitting in the external store for some time now. But they are a treasure trove of documents and ephemera that shed light on museums during the mid – late 20th century. An example of the box and material from the collection. I have completed a project of digitising the chosen documents using a flatbed scanner and then converting them to JPEGs and PDFs in order to make them easily accessible once uploaded. I have used two pieces of software for my project. One is Content DM. This is a metadata system which is specially designed for the digitisation of archives. It will hold the full versions of my oral history interviews as well as JPEG versions of the documents. The second piece of software was Omeka. This is what I actually built my learning resource on. Not only did I upload PDF versions of the documents, but also on there is basic metadata (which will be useful for student citations!). The resource is built using the exhibitions plug in and, although restricted as to how I could lay out the pages and not being able to put in decent sized PDF windows, I managed to upload the documents that I wanted and lay out the resource in a user friendly way. This was important for me as when looking for information, I know how important it is to make it easy and accessible for students. To get to the full PDF version, the student just needs to click on the thumbnail and, then they are taken to the metadata page which contains a downloadable version of the document. I am very pleased with the timelines and maps that I have embedded into the pages. They offer a different and fun way of presenting information to the students than just simply writing information in a block. I am also excited to share some new oral histories with people. I have personally recorded these testimonies myself and they are a fantastic resource to allow students a glimpse into a more modern perspective. They provide another type of medium on the pages for people to engage with and oral histories are always a lovely opportunity to hear the people themselves speak. I would have liked to have done a transcript for all of them but the one I did do was so difficult and time constraints meant that there was just simply not enough time. 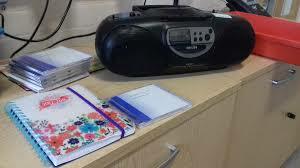 Listening to oral history records at the Leicestershire Record Office. I think that the new and most difficult part of the whole placement has been negotiating copyright laws and also writing the actual resource. I found copyright difficult just because there are so many different layers of people who could own the copyright and, especially with it being a legal matter, I wanted to ensure that I did all that I could in obtaining permission. For most, it was an easy email to a museum but for others it was quite complex. One document had no named author and the publishing company had not been active since the 1950s. With regards to writing the resource, it was difficult to write because of the fact that it was primarily for MA students. It did not need the level of explanation or interpretation that an exhibition to members of the public may have needed. So the issue was how far I should go. I hope I have achieved the balance that I wanted. So the learning resource is finished and waiting to go up. I have had a really lovely time here at special collections and I am very sad to be leaving this week. I feel like part of the team! I would like to thank everyone in Special Collections, the East Midland’s Oral History Archive and the library for all of their help and support and for being so friendly! I feel a lot more confident within myself and I thank you for that! I hope that people find the resource useful, entertaining and ultimately, an encouragement to come and use that collection and others within special collections.